The two Sangheili, Ivea 'Killamee and Asmi 'Motusee, were standing in their mighty Spire, overseeing the excavation currently taking place. The Field Marshall at the Spire's peak had demanded he not be disturbed while he spoke with the Hierarchs, and had left the two in charge for the time being. A map was displayed on one of the consoles, giving a rundown of the occupied area. Of note was a building near the Southwestern edge of the Spire's Shield, which held the last remnants of the humans on the planet. Scattered around were various husks of Covenant vehicles, as well as uncountable bodies. They had all fallen victim to the elite Human combatants in the building, what their enemies called "ODSTs". Regardless, they were suffering casualties as well, and likely wouldn't hold out for much longer. 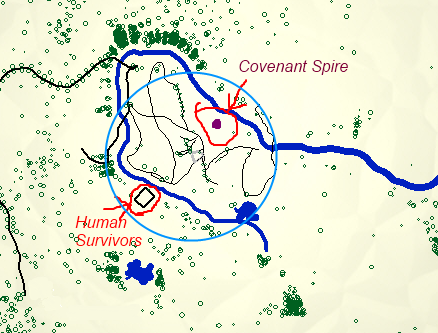 Victory was in the Covenant's grasp. The excavation site itself was very deep, leading far down into the reaches of the planet. It was there that a Forerunner artifact was located, and the Hierarchs wanted it. It could potentially lead to one of the Sacred Rings, and allow the start of the Great Journey. The CCS-Class Battlecruiser Infinite Glory was patrolling the system, seeking out Human reinforcements. So far, none had been found. It was a dull job, but rewarding. After all, they would be among the first to see the holy relic. "We should let my men pull them towards us so that we can pick them off one by one." Ivea 'Killamee said to his comrade. @Coyote: Can we get a relative scale of the map? Like how far is it to the building? How tall is the spire too? What's the environment like too? Can you tell us something like a key of the map? To summarize the mission; We are to attack the human building and basically kill everything (taking the object of interest after). At the same time, we want to defend our base, ei; the spire. The humans basically have the same objective? Defend their place and kill all of us? What happens if one team lets their base be destroyed but kills the rest of the team? Is there a time/countdown factor? Please correct or elaborate on any details of the objectives for each team. I'm gonna hold off on my post. As for the Spire height, it's about 300 meters. 2: I can't tell you what the opposing players objective is, sorry. As of right now, there's no timer/countdown. 3: If you lose the Spire, but are not killed, a Phantom will be sent to pick you up. So i take it we're not allowed to read their posts in the Minegarde thread? OOC: I'd prefer it if you didn't, but if you do, I simply ask you don't act on that information. If I suspect cheating, bad things will happen. We have radio communication right? Or something that achieves the same purpose. What's the environment? Forest? City? "My men will go out as well, shield bearers at the front and snipers hidden behind." The shield bearers marched out, eyes peeled for enemy troopers. They spread themselves out a little bit, following no particular formation. Should they be attacked, they would form a wall in the direction of the enemy assault, and focus on defense and retreat. The snipers kept back some fifty meters meters, spread out and vigilant as well. Should the leading team be attacked, they would scatter over a large distance around the engagement, take cover and look for targets. If appropriate, namely if an enemy approached, they would engage their active camouflage. Asmi remained behind his snipers a smaller distance of maybe twenty or thirty meters, active camouflage engaged. If the leading team was attacked, he would take cover and look for targets (if plausible). Ivea ordered his men to keep a fair distance ahead of him and the other units slightly spread, and began the march towards the human compound. Since he had permanent cameo he would move slowly and try and keep to the high ground as much as possible. Unless Sunfish wants otherwise, I'd keep my men (including myself) separate but somewhat nearby (within long range shooting distance maybe) his. OOC: Yes, you all have long range communication. Feel free to split up. The large group moved from the Spire, splitting up in the various directions they were told to. They passed several trees, all of which could provide rudimentary cover from the Human weapons, if only for a time. They came to a street that went Northwest to Southeast, an obliterated structure visible to the southeast as well. Smoke was rising from it and fires were raging in what was left of it. There was rustling in a bush to the left, and one of the Jackals fired. The blue bolt of plasma set the bush aflame, and a small creature tumbled out, roasted by the superheated air. About how far would we have traveled? Just a few hundred meters? Asmi's troops continued along their route with the same formation and mentality. Ivea continued to follow his men from a distance, careful to keep an eye out for suspicious movement. They continued on through the city, rather uneventfully. Suddenly, several rounds impacted Asmi's shields, dropping them to 1/3 (-55 shield, 20 remaining). 3 humans, armed with automatic weapons, attacked from a defensive position directly ahead. They were covered by chunks of building, and were firing sporadically, the Jackal's shields reflecting the majority. Just so I'm understanding this right, Asmi got hit with his active camouflage on, and past all of the other troops that he was following behind? Would it be same to assume it was a random and lucky shot? The shield bearers got into a tight formation and put their shields together to make a wall. In that formation they began their retreat. The snipers took cover, including Asmi, scattered and took cover. OOC: The first one was a lucky round. Your shields flared, causing the human to aim a little better. I'll wait for Sun before I proceed. Ivea's shield bearers pushed forward, trying to protect the heavier weaponry in the back. The Brutes attempted to fire upon the humans while Ivea backed up and tried to line up a good shot and would fire when ready. One of the Brutes opened up with his explosive weapon, firing two rounds and catching one of the humans, a female from the screech. She was launched and, on impact, rolled and didn't get up. The remaining humans focused on the brute, filling him with lead (-30 HP, 95HP Remaining) but only serving to make the ape-like being angry. "To hell with you split chin!" Cried the remaining one, chucking a fragmentation grenade into the crowd of Ivea's troops. The Jackals and lone Grunt dove away, successfully evading the blast. Ivea too reflexively rolled away as the grenade detonated. He dodged a good chunk of it, but some metal pinged off of his shields (-20 shield, 55 remaining). They flared, but otherwise kept the Sangheili safe. The three brutes weren't as lucky, taking large amounts of shrapnel (-35 HP for all 3) as they were too slow to begin to evade. They were all knocked over by the blast, and were unable to retaliate. The human then quickly fled, firing over his shoulder but missing spectacularly. All of the snipers in Asmi's unit (including himself) moved up and tried to get into a position where they could take the retreating ODST down. The shield bearers in his unit moved ahead in their line formation, but not far, and tried not to get in the line of sniper fire. OOC: Not an ODST, for the record. Just a simple civilian that managed to grab a gun and grenades. One of the Skirmishers had a shot, and took it. The plasma beam tore a chunk out of the man's left leg, and he collapsed with a scream. The rest moved up, not sure what Asmi wanted to do with the wounded human. I'm not entirely sure how an Elite commander (or covenant in general) should act in this situation. Oh well. "Maintain formation." Asmi ordered his troops, and on command they spread out as they were originally; shield bearers up front, snipers back some fifty meters, leaving Asmi behind about twenty or thirty meters behind them, all scattered out. They held position after that, while Asmi worked with the wounded human. Before anything, Asmi removed the automatic rifle and grenades (and anything else) from the human's possession. He then disengaged his cloaking device. "We can work out an arrangement." He said, hoping the human was still coherent. I'm not sure if taking P.O.W. 's is something an elite would do. If it's an issue, well, I'll work with it. Would the human be at risk of bleeding out? Ivea ordered his men back and had one of the elites throw down a drop shield to heal the brutes. He then went over by his fellow elite commander and said, "He looks like a civilian, he probably won't know much. You should just kill him." How would language be working here? Would the human be able to understand Ivea if Ivea spoke in... Covenant language. Can we assume he spoke in that language (as oppossed to saying "lets kill the human" right next to the human)? What is the Covenant language? We can speak in English though, right? Speaking in native tongue, Asmi said, "We will find out." OOC: Not at risk of bleeding out, but he *is* at risk of dying from shock. Each member of the Covenant has their own language, but all members of the Covenant can understand one another. As I mentioned before, you can understand them, they can't understand you. You'd need a specialized translator who speaks their language. "Go...to hell!" The human replied, weakly punching at Asmi. The Elite's shield flared slightly, but didn't suffer from any noticeable damage. One of the Minor Elites dropped a shield, and the brutes reluctantly entered. The most injured one huffed at the man on the ground, disappointed he wouldn't be the one to kill him. "He's all yours." Ivea said before looking around. "As soon as the brutes heal we should move out." Asmi engaged his wrist blade and plunged it into the neck of the human, slicing to finish him off. Disengaging the blade and standing up, he reactivated his active camouflage. "I will wait for you." The Brutes, now fully healed after several deployments of the shields, moved into formation. One approached the dead female and stomped on her head, crushing it into dust. "You ALL shall fall just the same, scum." He then returned to formation, red footprints following his path. Asmi's unit followed the same formation as before. The shield bears were scattered in the lead. The snipers approximately fifty meters behind, scattered and loosely going from cover to cover. Asmi was about twenty meters behind the snipers, cover jumping similarly. Careful not to take anymore damage, Ivea had his men stick close behind his shield bearers while he followed from a fair distance, moving from cover to cover. The Sangheili's comm units crackled to life, and a gruff sounding voice came over the line. "Motusee, Killamee, where have you gone?" The Field Marshall asked, simple curiosity in his voice. "I believe I asked that you watch the dig site." "We went out in search of the enemy, to preemptively destroy them. We planned on attacking their outpost. Shall we return?"